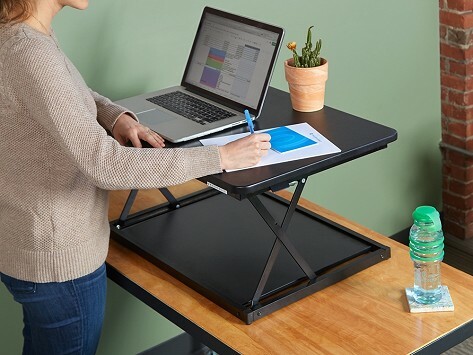 This adjustable standing desk sits on a surface to become your no-installation-needed ergonomic work station. It moves up and down in seconds, thanks to a spring-lifting mechanism. Four height settings help you get the right fit and the desk’s straight vertical movement—along with a small footprint—means it won’t take over your space. It’s best suited for a laptop, but can handle a desktop with room to spare for other workday essentials. Dimensions: Top surface: 27.5" x 19.5"; Height minimum: 3"; Height maximum: 14"
Uncaged Ergonomics Maker Joseph Send first made an ergonomic textbook holder before focusing on desks. His easy-up and easy-down designs make standing up while working as easy as, well, standing up. A springed mechanism lets these adjustable desks pop up (and back down) in seconds and remain stable. That, along with their small footprints, means you can reap those standing health benefits without sacrificing work space. There’s room for workday essentials on the surface and multiple height levels to get into the perfect working position. When Joseph streamlined out the bulk some other standing desks have, he also eliminated the need for installation. Just set a desk on top of your work space and get to it.